Leading UK VFX facility DNegTV to open L.A. office. 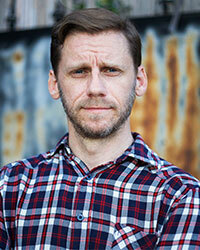 Andy Williams appointed to Head up the studio. London, 25th August 2016: DNegTV has announced that it is to set up a team in Los Angeles, headed up by former Stargate Studios Head of Production, Andy Williams. The television arm of multi-award-winning Double Negative, DNegTV is one of the UK’s leading VFX facilities for television, working on the likes of Emerald City (NBC), BrainDead (CBS), Fortitude (Sky), Agent Carter (Marvel TV) and The Young Pope (Sky/HBO). DNegTV Executive Producer and Co-Founder Louise Hussey said of the move, "Our remit on setting up DNegTV was to work with major international broadcasters to create cutting edge VFX for high-end dramas. Since our inception in 2013 we’ve enjoyed excellent working relationships with many of the major U.S production companies and to ensure we can continue to offer and expand our high levels of service it’s become key for us to have an L.A presence. The fact that we will now be able to provide local facilities, support and investment in the U.S. is very important to us and to our future plans. "We are delighted to have long term friend and colleague, Andy Williams, join us as Executive Producer. Andy will head up the new L.A office and act as local point of contact for clients on the West Coast." Andy Williams joins DNegTV from Stargate Studios where he oversaw the studio's North American operations as Head of Production. An experienced producer with over 17 years experience in television, prior to his time at Stargate Studios Andy spent seven years as Head of Production and Executive Producer at DIVE (Alkemy X) in New York.